Storm | Meet The Ambassador | RAPTOR Inc.
Storm: arrived at RAPTOR Inc. in 2007 after catching his wing in the seam of a barn. The injury left him unable to fly so he stayed with RAPTOR Inc. as an avian ambassador. He stands at 14″ tall, weighs 1 lb. and has a 44″ wingspan. 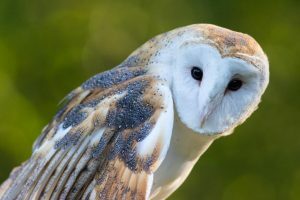 Barn Owls are nocturnal and hunt by sound. In the wild. barn owl’s distinctive heart shaped face helps funnel sounds into their ears. Storm is often very vocal at programs where he can be recognized by the barn owls distinctive screech.